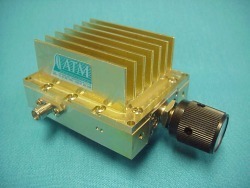 ATM manufactures a wide variety of Medium and High Power "CVA" Attenuators with SMA and Type-N connectors. These medium and high power continuously variable attenuators are offered in 15W, 30W and 50W models. While there exists some overlap in performance between different models, careful review of the mechanical outline drawings and the corresponding tables should reveal the right model. As always, please feel to call us and discuss your needs with one of our design engineers. Units use multi-turn non-translating shafts, and will reach full attenuation in less than 30 turns. For Type-N, add "N/F" suffix to Model No.